Predatory publishing has been on our radar for quite a while now, but mainstream media coverage and awareness is rapidly intensifying. We have perhaps finally reached a point where the damage being done to the credibility of research may be enough to move the stakeholders involved — universities, funders, and publishers, to finally take some action. Just what that action will be is unclear — like most of our lingering problems, if there was an easy solution, it would have happened long ago. In light of the increasing debate, I thought it worth revisiting some of our coverage of predatory publishing over the years. We are planning an item about why we use the term ‘illegitimate publisher’ rather than ‘predator publisher’. We have included here links to the best related items in the Resource Library. 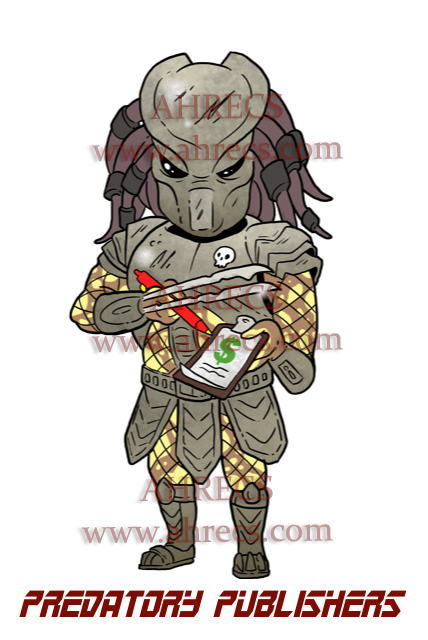 Just a reminder the predator image is available, with watermarks via the AHRECS subscribers’ area. Kent Anderson first wrote about the phenomenon back in 2012, in his post, “Predatory” Open Access Publishers — The Natural Extreme of an Author-Pays Model. It’s interesting to see that even in this early post, the focus was on the author-pays model, rather than a condemnation of open access as a whole. Also interesting to see how much unconditional support there was (particularly in the comments) for Jeffrey Beall’s list, which later fell under so much controversy. Speaking of Beall, a trio of posts — two interviews, the first in the form of a podcast from 2013, and the second as a written interview, done after Beall had taken a public swipe at The Scholarly Kitchen. And finally, Joe Esposito’s post entitled, “Parting Company with Jeffrey Beall“, where he tried to come to grips with Beall’s increasingly problematic rhetoric.